Early computing was big computing. Everyone has seen, at least in pictures, valve computing that took up entire rooms. The mainframe computer may have had a tiny terminal for access but the machine used was enormous and usually installed in a large cupboard tidily out of sight. This put limits on the way we expected computers to interact with us. In fairness, punch cards probably also had a certain effect on the way we expected to use computers too. Then in the 1980s things began to change. We began to move away from huge computing devices and we started to build smaller computers. The laptop, even if some of the earliest machines need rather more than a lap to support them, suddenly enabled us to use computers on the move. It was this change in computing; the ability to compute-on-the-go as it were that changed the way we thought about computer interactions. Bill Schilit in 1994 introduced the idea of context aware computing. 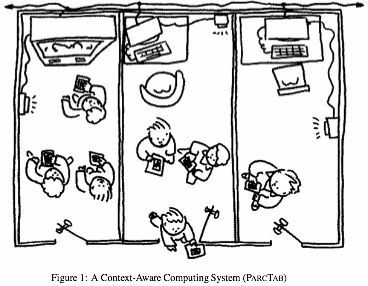 Context aware computing would enable the functions of a device or its software to change depending on where it was used, how many people were nearby at the time, the availability of other connections or devices were around, etc. Thus context aware computing would enable our devices and software to react to the environment around them. The first steps in context aware computing focused upon our locations; the GPS network of the 1990s led to satnav systems in vehicles all over the world. Yet, of course, our context can and should be seen as rather more than where we are physically located at any moment. For example; I might want an alarm on my watch to tell me it’s lunchtime in the office. However, I don’t want that alarm to go off if my boss is in sight. He might think the alarm meant that I was lazy or under-motivated and anxious to use the entire lunch break rather than dedicatedly put in a few more minutes like everyone else before heading off for a cheese sandwich and a warm coffee. Our context requires a rather deeper understanding of our environment than “you’re at your desk” doesn’t it? If you’d like to know how context aware computing is developing and the challenges that are currently being faced in the field then check out Keith Cheverst’s book on Context Aware Computing here. Keith’s a Senior Lecturer in Lancaster University’s Computing Department and an acclaimed expert in the field of context aware computing too.